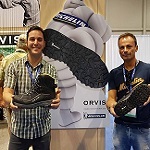 Taking the rugged landscape of the outdoors into a world of high-end modernistic aesthetics, the ECCO EXOSTRIKE™ combines fully functional attributes with street-smart styling, and innovative design. This revolution in ECCO design includes the unparalleled softness and dramatic rebound of a PHORENE™ ribbed midsole, matched with an eye-catching external P.U heel stiffener and T.PU toe cap. 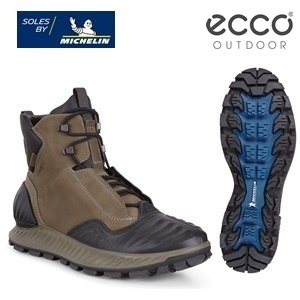 In conjunction with this, ECCO Outdoor and the world-renowned tyre brand, Michelin, have collaborated to create a winter compound outsole with an upgraded tread pattern that takes trail grabbing torque to an all new level. The partnership with Michelin adds an unparalleled level of credibility and showcases ECCO Outdoors intent to challenge both design and functionality innovation at every turn.